Soldiers train for IA duty at Ft. Jackson, S.C.
Tuesday – Dec 4th, we are highlighting a different kind of deployment. The Individual Augmentation. Most of these deployments are 6 to 13 months in length and are generally to Afghanistan, Iraq, the horn of Africa and a few other places around the world. The Individual Augmentee is generally assigned to an Army unit. 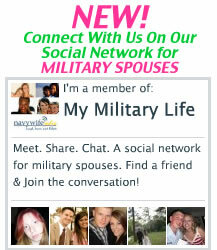 If your husband has been assigned as an IA recently or in the past we want your insights, advice and experience. Join us as we chat about this hot topic. *How much notice did you get? *How long was your husbands deployment? *What type of communication did you have? *How long did mail take? *What type of support did you receive from his command? *Did you connect with other IA’s wives during the deployment? We’ll be talking about these questions and more. UPDATE: We will be welcoming Air Force wife, Julie Negron in the last half of the show in our segment “My Military Life” . You Know Julie or “Jewls” from her hit comic strip “Jenny Spouse”. Don’t miss the laughs! Be sure to mark your calendar, you don’t want to miss this show LIVE! We will be taking your calls! Our call in # is 646-652-4629. Update: Thank you everyone who participated in tonights show. This topic is sort of like opening a can of worms, we have already scheduled a 2nd IA show in Jan 08. We hit a record for most LIVE listeners! I’ll be making a follow up post on the blog tomorrow, in the meantime…..on tonight’s show we talked about ECRC (Expeditionary Combat Readiness Command) as a resource for the family who has a Sailor on an IA. I know wanting a “person” vs. a website is something we all prefer, however I encourage you visit this website and learn more about what you can expect if your Sailor is on an IA now or in the future. You will find lots of great information. Look for our next IA Show Jan. 22nd where we will have a “Town Hall” type meeting with a representative from ECRC and we’ll take your questions about policy, negotiating for IA orders, notice time frames, is it better to go on an IA in route to your next duty station, etc….